Thomas DeLONG (c. 1755 – bef. 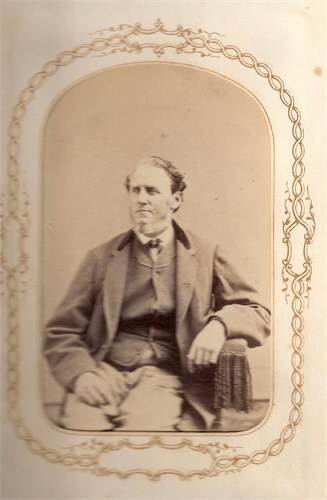 1850) was Alex’s 6th Grandfather; one of 128 in this generation of the Shaw line. Thomas DeLong was born about 1755 in Dutchess County, New York. He married Eleanor [BORDEN?]. His parents were Jacobus DeLANGE and Elizabeth BUCK. He was in Roxbury, Delaware County, N.Y. in 1804. Thomas died before 1850 in Caroline, Tompkins NY. Eleanor [Borden?] was born 17 Jul 1761 [Calculated based on the inscription on her headstone]. Eleanor died 28 Dec 1849 in Caroline, Tomkins, New York and is buried in the Central Chapel Cemetery/ Brooktondale, Tompkins, NY. “age 88 yrs., 5 mo’s 11 dy’s” She is buried next to her daughter Mary DeLong TURK. 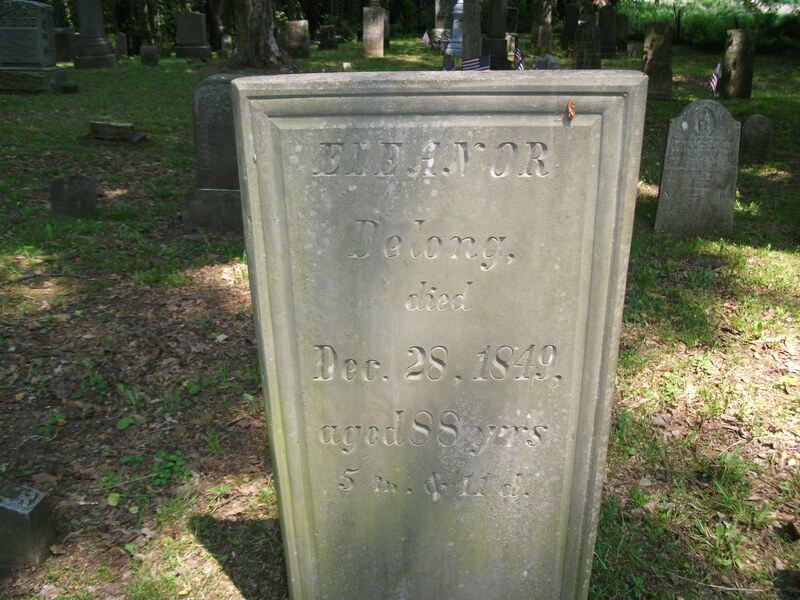 Eleanor DeLong Headstone – Central Chapel Cemetery Memorial Day 2012 — – died Dec. 28, 1849 age 88 yrs., 5 mo’s 11 dy’s – She is buried next to her daughter Mary DeLong Turk. 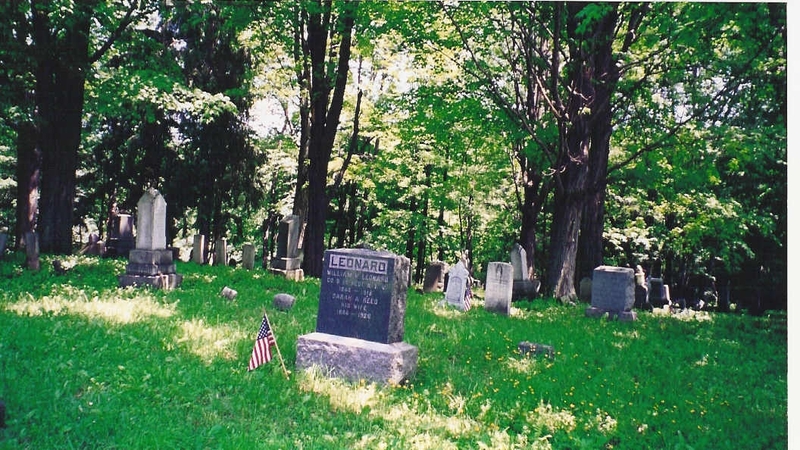 Eleanor is buried at Central Chapel Cemetery, Caroline, Tompkins, NY Also known as: Schoonmaker and LeonardLocated on Central Chapel Road, about 2 miles south of Brooktondale. Cemetery is located near the intersection of Braley Hill Road. 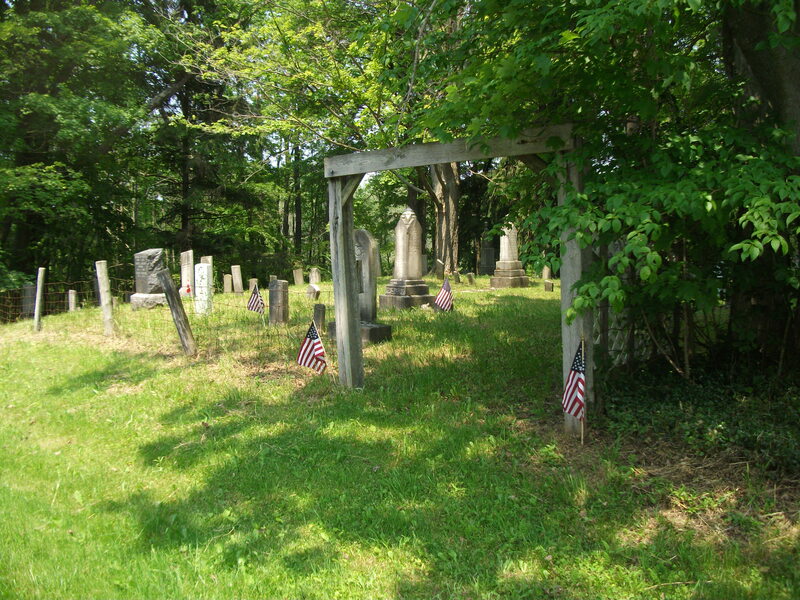 The first burial in this cemetery was Moses Schoonmaker, 1815 (per headstone inscriptions). A family legend says that Mary’s grand daughter Ruth was a descendent of the Marquis De Longe who was guillotined in the French Revolution. The legend states his wife and daughter escaped the country and his daughter married an American. Mary died 2 Sep 1866 in Caroline, Tompkins, New York. In the 1810 census, a Thomas DeLong was living in Ovid, Seneca, New York with a wife and three young daughters. The lack of boys makes me think he was not our Thomas. In 1788, while Israel Inman was on one of his hunting excursions, he came upon the broad and beautiful flats, as they seemed to him, of the east branch of the Delaware river, near its headwaters, and about two miles above the present village of Roxbury. The valley and hillsides were covered with the forests. To him this was just the place to pitch his tent, and he commenced a settlement, doing but very little clearing, for agriculture was not his “hobby,” as he was born and bred a hunter. John More had settled over east of the Grand Gorge, six miles east, some two years previous, but west of the gorge Inman was the pioneer, as far as Roxbury is concerned. In 1789 a party of “land lookers,” consisting of some twenty families, came into Delaware county from Fairfield county, Conn., to explore and fix upon a favorable place for a permanent settlement. The party came by way of Catskill, over roads of a primitive sort, with a blaze upon a tree here and there for a guide, and with streams unbridged. After passing several small settlements, they arrived at Benjamin Barlow’s, in Stamford, some distance below the mouth of Rose brook, on the Delaware. As the “barn room” for horses was rather scarce, the horses were turned into the woods to browse. On the third day they were missing, and a searching party, composed of Abram Gould, George Squires and Josiah Patchin, was sent out with three days’ provisions to find them. Following the trail of the horses, the searchers were led up Rose brook, and at noon were at the top of the mountain, nearly where the road now crosses. They soon discovered the hunter Inman, who was a stranger to them. He had the day before taken up the horses, and was following up the trail to discover, if possible, the owners. The hunter immediately conducted the three strangers to his hospitable mansion in the valley, and with all the well known hospitality of a pioneer, treated them to a repast of venison steak. Ascertaining that they were in search of a good location for a permanent settlement, he volunteered his assistance, as he knew every inch of the ground. They went up what is now West Settlement brook, and decided upon that valley as the place of their future abode, and returned again to the rest of the party with the missing horses. They prevailed upon two others of the party to accompany them, namely, Nehemiah Hayes and David Squires. In moving into their new settlement they went by way of what is now Stamford and Moresville, thence along an Indian trail through the gorge, down the Delaware to the little clearing of Inman. Their journey was a laborious one. Their goods were left at Inman’s until they could prepare a place of their own, which was but a few days. The land was measured off with a piece of rope. In “drawing cuts” the middle lot fell to George Squires, and on his lot they erected a rude cabin of crotches and poles, covered with elm bark. Their bedding was the boughs of trees, their chairs were blocks of wood, and their dishes large chips. The cooking was done in a large kettle suspended over a fire beside a huge maple log in front of the door. In this mansion in the forest they passed the remainder of the summer. In this primitive way commenced the settlement of the present flourishing village of Roxbury. This town was formed from Stamford March 23rd, 1799. Unfortunately the leaf containing the proceedings of the first town meeting is missing from the clerk’s record-book. On a later page we have it recorded that “the subscribers, finding it necessary to lay out a road from Mantana kill [adopt] a westerly course, beginning at a heap of stones and running near the dwelling house of William Varmilya, and from thence by a line of marked trees to the dwelling house of Thomas Austin, to a beech tree marked H; the same being four rods wide. Have been researching the Delong family of Tompkins county NY and noted your entries on Ancestry.com. I am descended from a Jacob Delong born 1780 who moved to Caroline in 1813. On Nov 10 1801 he married Hannah Walker, daughter of Philip Walker. He had a son Jacob Delong born in 1816 who is my ancestor. He was the only Delong head of house living in Tompkins County in the 1810 to 1830 US & NY Census. In addition to Jacob, Thomas Delong had a son Joseph born about 1783, possibly in Dutchess County, NY, who was living in adjacent Tioga County in 1810. My own feeling based on known circumstances is that this Joseph Delong was the mystery Delong who married Lydia Paine. This opinion is shared by John Baldwin of Cleveland, OH who has done extensive work on all New York Delong families. Granted, no solid proof. Do have the Delong ancestry back to the immigrant should you need it. married ???? DeLong she is buried in Caroline,NY. 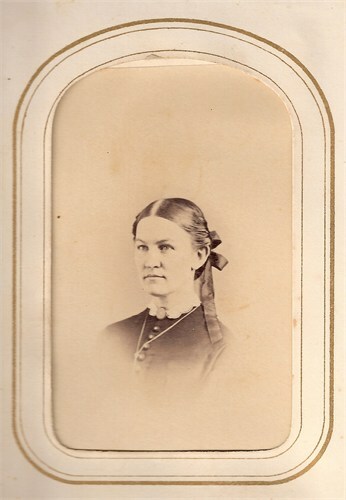 2 of her children are Jacob m.Hannah Walker, and Mary Ann DeLong b.1782 m. Cornelius Turk. They were in Roxbury, Delaware County, N.Y. in 1804. Was wondering if anyone has the Roxbury Dutch Reform Church Book??? Jacob’s wife Hannah Walker was born in 13 Aug 1779 in Rehoboth, Mass. Her parents were Philip Walker (1751 – 1831) and Hannah Hall (1755 – 1790). Hannah died 10 Jul 1831 in Dryden, Tompkins, NY. In the 1810 census, Jacob was living in Roxbury, Delaware, NY and already had two boys and one girl under 10 years old. 1813 – Jacob was a pioneer arriving in Caroline County New York, the same year as James Bishop, Thomas Haggan, Joel Hastings, Asa Leonard and Moses D. P. Schoonmaker. In the 1820 census, Jacob was living in Caroline, Tompkins, NY with his wife and six children 4 boys and 2 girls. In the 1830 census, Jacob was living in Caroline, Tompkins, NY. His birth is shown as 1770- 1780 and his wife the same, with one daughter age 5 thru 9. In the 1840 census, a Jacob DeLong was living in Dryden Township, Tompkins, NY, age between 40 and 49. The implied birth (1790 – 1800) is between our guesses for him and his son. This census also shows 1 woman age 40-49, 1 girl age 5-9, and 1 girl age 10-14. Jacob was a carpenter. i. William F. DeLong b. 1804/1805 in Delaware, NY; d. 11 Nov 1870 in Trumansburg, Tompkins, NY ; m. Almira [__?__] (1804 – 1875) In the 1860 census, William and Almira were living in Covert, Seneca, New York where William was a sawyer. 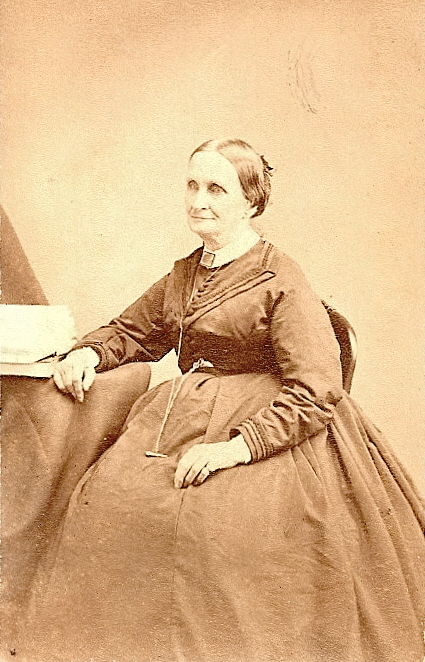 Joseph’s wife Lydia Payne was born about 1793 in New York. Her parents were David Paine and Sarah Cornell. Lydia died after 1860 in Caroline, Tompkins Co., New York. In the 1850 census, Lydia was living in Caroline, Tompkins, New York with her daughter Sarah, age 14. Both were born in New York, no occupation or real estate noted. In the 1860 census, Lydia was still living in Caroline New York. Her occupation was “weaver” with real property of only $250 and $50 of personal property. Living with her was Ellis Doty, age 75 (called a “pauper” and perhaps a relation to her brother David’s wife) and a 6 year old boy named Lewis Perry. They lived nearby to farmer David Pain, age 65, perhaps Lydia’s brother. Jonas DeLong was living in Candor, Tioga Co. NY; b. 1800-1810 (age 30-39.) Shown with a woman of the same age group, 2 boys 5-9, and 1 girl under 5. 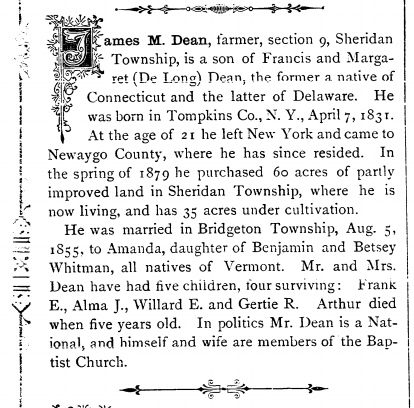 There were also 3 families in nearby Steuben Co.
Margaret’s husband Francis Dean was born in 1814 in Connecticut. Looking for parents, siblings,and children, on a Margaret DeLong , born abt 1799,( d. abt. 1870) she married Francis Dean(e), They are in the 1840 census of Hector, Tompkins Co, NY, with eleven children, and a older man 70/80. 1850 census, no Francis. I am researching Fauver……..Sarah L. Fauver (perhaps nee Dean(e) is buried in Hauber Cemetery…listed as spouse of David. I think perhaps Sarah’s middle name was Louise and she may have been a sister to Ella (Deane) Hauber. Since you posted three years ago now, you may have more information by now. I have other information that I can share with you. i. Thomas Dean b. Jan 1830 in Tompkins, NY; d. 20 Jul 1903 in Spring Mills, NY; m. Elsie (Elsy) Skillman (Jan 1850 NY – 1916) Her parents were Jesse Carr Skillman (1814 – 1879) and Anna Young (1818 – 1889). ii. James M Dean b. 7 Apr 1831 in Tompkins County, New York; d. 16 Nov 1909 Fremont, Newaygo, Michigan; m. 5 Aug 1855 Bridgeton, Newaygo, Michigan to Amanda Whitman (b. 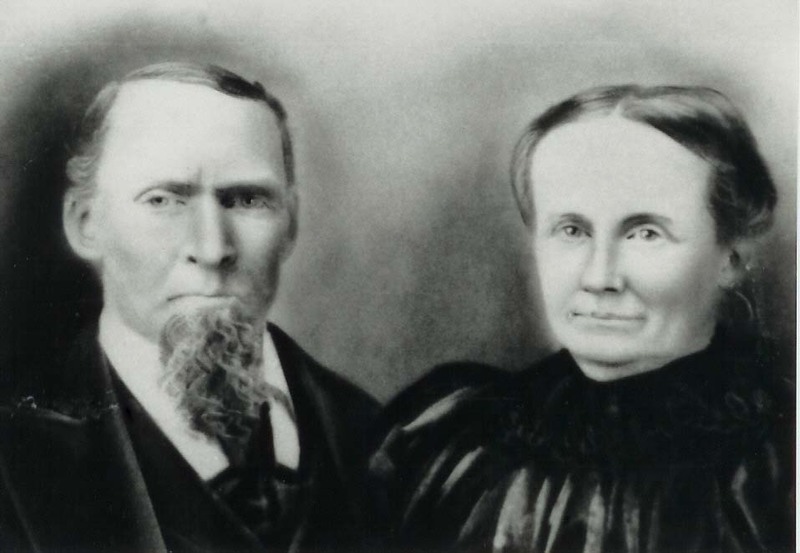 25 Mar 1842 in Crown Point, New York – d. 10 Dec 1928 in Fremont, Newaygo County, Michigan) Her parents were Benjamin Whitman (1787 – 1880) and Elizabeth (Betsy) Monroe (1807 – 1876). In the 1880 census, David was a lumberman in North La Crosse, La Crosse, Wisconsin. vii. John Dean b. 2 Sep 1843 in Hector, Tompkins, NY; d. 13 Dec 1928 in Whitesville, Allegany, NY. He was buried in Rural Cemetery, Whitesville, Allegany Co., NY; m. 5 Jul 1864 in Rexville, Steuben, NY, to Hannah Elizabeth Trowbridge (b. 30 Apr 1850 Hornell, Steuben, New York – d. 28 Oct 1925 – Whitesville, Allegany, New York) Her parents were Aldrick Alaric Trowbridge and Elizabeth Liddard. In the 1880 census, John and Elizabeth were farming in Birdsall, Allegany, New York. Suffered Shock on December 6th from which he was unable to Recover-Leaves Children, Grandchild and Great Grandchilden. John Dean, aged 85 years last September, answered “Taps” for the last time on Thursday, December 13th, 1928, when he succumbed to the effects of a shock suffered just a week previous on Thursday, December 6th. He had been quite active up to that time and was often seen driving through the village. Mr. Dean was a verteran of the Civil war and next to the last of the local members of the G.A.R. He enlisted in the Civil War army, Oct. 8, 1861 from Tompkins Co., NY, and was honorably discharged June 9, 1863 at the expiration of the term. His marriage occcurred July 5th, 1864 at Rexville and he re-enlisted in Septemver of that year and was made corporal. He served until he was wounded in the hip and was discharged March 31, 1865 at Elmira. He was married to Miss Elizabeth Trowbridge who preceded him to the Great Beyond. John and Elizabeth celebrated their 60th wedding anniversary July 5th 1925. To them were born six children as follows: Mrs. Anna Elliott of Candor, NY, Ed Dean, Mrs. Lillian Teribuary (Teribury), and Mrs. Addie Crawford of Andover, Fred and Edwin (Erwin) of Whitsville. Beside the children he is survived by a large number of grandchildren and one great grandchild. His death breaks a familly of five generations. The funeral was held from the late home just below the village on the Genesee road, Saturday, December 15, 1928, Rev. Engler officiating and Fred Wildman in charge. Interment was in the family plot in Rural cemetery. Besides the immediate family with the exception of Mrs. Anna Elliott who was too ill to attend there were present at the last service Ed Elliott and Hobart Dean and family of Candor, Mr. and Mrs. Vet Dean of Elmer, Pa. beside the neighbors and friends. Front Row: Mary Ella Dean, John Dean, Virginia Elliott, Dean Smith, Alice Dean, Ann Elliott, Donald Smith, Clarence Carson, Elizabeth Anna Teribury, Leola Teribury, Dale Smith, Donna Smith, Bessie Dean, Freda Dean, James Dean, Alberta Dean, George Elliot. Chairs: Hannah Elizabeth Trowbridge Dean and John Henry Dean. 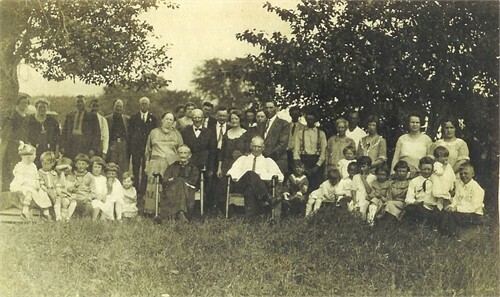 Back Row: Nellie Dean, Anna Carson, George Conley, Fred Dean, Cloyd Dean, Ed Elliott, Anna Elliott, Lunita Elliott, Lydia Slate Dean, George Elliott, Hobart Dean, Eddie Dean, Volney Smiths wife behind Addie Dean Crawford, Volney Smith, Elizabeth Dean Teribury, Truman Crawford, Ray Smith, Ervin Dean, Nellie Skillman Dean, Arthur Teribury, Jennie Carson Teribury, Violet Dean Smith, Grace Ellison Dean. This entry was posted in -8th Generation, Line - Shaw, Missing Parents and tagged Roxbury NY Pioneer. Bookmark the permalink. I have information on Sarah Dean who married David Fauver if anyone is interested. Her burial place, children, etc. My history includes an extensive Fauver history as well. I am wondering about the Delongs that were in Steuben County, NY and then went to Michigan. I also have ancestors I am researching Andrew Murray DeLong. Steuben County NY had brother Harmon C Delong, Mary Jane Delong, Margaret E Delong . All of these kids were the children of William Delong and Ann Gleason. They lived in Steuben County, NY and then moved to Cass County, MI area. Hoping someone knows who William is? Williams daughter ‘s death gives his name as William Andrew Murray Delong.